Rukhsana Parveen Haque, 47, is an ordinary woman with an extraordinary zest to prioritize her fitness. Her daily posts on fitness speak volumes on women fitness. Born in Tezpur and brought up partially in Guwahati and Tezpur, she graduated in Physics & MBA from AMU,Aligarh. She was commissioned in the Indian Air Force in 1996 as a Pilot Officer (Administrative Branch), earned a para badge by Skydiving in NDA, Pune in 2000. Retired as a Squadron Leader in Dec’2007 after twelve years. Interestingly, she filed a writ petition along with her senior, Wing Commander Anupama Joshi during May’2007 in the Delhi High Court for granting Permanent Commission to Women Officers serving as Ground Duty Officers and was granted the same in 2010. However, she didn’t join back as she was already in the Corporate domain and had achieved what they had set out to – Women & Men to be at par…no gender bias!! 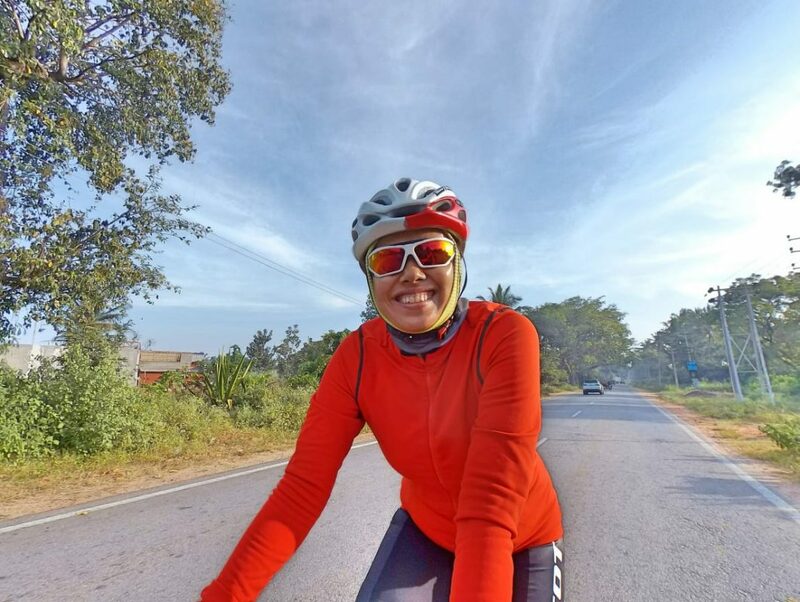 She has cycled almost 19000 kms and run 1600 kms since 2015. Her Strava stands testimony to all these big figures. Here’s Rukhsana’s fitness journey in her own words for every woman out there who thinks it’s too late! The cycling and running bug bit me sometime 3 years ago!!! Before that it was just an abstract thought dictated by the ever growing media deluge for fitness and work-life balance etc. But three years ago, I seriously decided to turn this abstraction into reality and brought myself a lovely cycle and associated clothing to go with it….I joined a number of cycling groups and after I shifted residence closer to my work place, I realized I had more time to devote and gradually this became an addictive pastime with added benefits to my health….Thus here goes my story…. To start…..I will give due credit to my better half for imploring me to get into a habit so that I don’t chew his brains out every now & then for leisure activities like movies or socializing with friends!!! He is, as any ‘normal’ Indian (Ha Ha) is, obsessed with cricket and like most, only an avid cricket watcher. And we all know how these men get glued to the small screen for days and weeks…. like forever…… I was a ‘cricket’ widow!!!! I started asking myself what I could do; what was my calling; especially those weekend days when I was home and there was sports on TV. I put my heart into cycling and before I realized it, it became a passion: CYCLING has become my obsession now and I am mighty proud of it, since besides contributing to my health, it has become a source of much happiness. Nowadays I look forward to getting into this routine of Bicycling/Running and meeting other riders, runners along the way. I also feel good about myself, especially whenever I set myself a target and I achieve it!!!. The tougher the target, more is the effort put in to achieve it, but when it is accomplished, nothing beats the feeling!! One feels one has earned everything and then one can gorge on food with no feeling of guilt whatsoever!!! The added benefits of this is one also wants to dress beautifully; you are on a high more often than not!!! The lows almost appear to disappear from your daily life, including during tough & rough days in office. Someone asks you, “30+”! You say, ‘WTF’!? but you feel joyous!! Medicines have become a thing of the past… no bad cholesterol, no signs of hyper-thyroidism, no skin ailments….Nothing at all…It feels great!! And you feel alive. Just dress up every morning at dawn and show up!! Look after yourself ….and get out of that drudgery of home & hearth. Explore the world by knowing yourself first: how much can you stretch yourself. Shine….in the sun, when it rains or when it is icy cold….Be one with nature and hear the chirping of the birds, the rustling of the leaves as the wind blows…with the occasional city vehicles plying ferociously and destroying the pleasantness, haha…. I am a testimony to a non-athlete becoming an avid cyclist and a runner, only on her commitment and determination. It wasn’t easy for her and believe me, family size has nothing to do with it. There are detractors every where and her mind is as big a nay-sayer as any of ours. The difference is that she chose to prioritise her health and well-being over everything else and kept at it, against all odds. You are an inspiration Rukhsana and I wish many more thousand miles with that infectious smile !! Love !! Great Going Ruksana.Super proud of you and you are truly an inspiration for all of us. Best wishes to you . Congratulations RPH. You are a champion and true inspiration. Thank you Pradeep; you have always participated along in the runs & rides with me in Dwarka and I’m so glad that you’re becoming one great duathlete too!! Rock on…. Thank you Vivek. When are you getting back to the gym? Rukhsana, whom I have been seen you as a courageous , challenging against Odd , Do something different and very Good in communication. Perfect in HR and as well as good Motivater .. Ur look and physical activity says that U r 30+ , ask writer not to mention your original bioligical Age.. .
After reading your total run and cycle Ride , My salute to you..
One thing I knew that u did ur MBA from IIM Ahamdabad from where u got selected in The corporate where we met . Which didn’t mention here. Stay Blessed and safe Always .. Thank you, Jayanta. I deliberately wanted people to know that age is just a number and in the mind. You are what you think and I feel I am 25 years old! I have done the Armed Forces Programme from IIMA, a six months residential course specially designed for the Armed Forces Officers. Thanks a ton Bordo Sir. I have done a bit of North East – in and around Guwahati, Tezpur – Bhalukpong – short of Tawang ( Nyungdam Memorial) and look forward to ride there again and again…. Thank you once again, Ma’am. So your original comment was always there….Many Thanks..